From the “Mountaintop to Mainstreet” is a powerful riveting documentary that deals with Poverty in America. The documentary focuses on the connection of the Poor Peoples Campaign. This would have been an initiative that was to be kicked off by Rev. 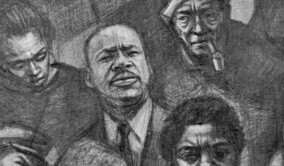 Dr. Martin Luther King Jr. and the Southern Christian Leadership Conference. But the initiative was snuffed out by an assassin’s bullet at the Lorraine Motel on April 4, 1968 with the assassination of Rev. Dr. Martin Luther Luther King Jr.
Rev. Carl Gilliard, CEO of Feed the Hungry takes an in depth look at Poverty and its affect on the Homeless and working poor. There are various interviews from some of Dr. King’s former staff members, agency directors, Families, national leaders and social service providers. This documentary illustrates the need for a unified approach to provide health for the homeless and working poor. It also shows several historical connections in what we could have done to prevent where we are today. As Rev. Gilliard says in the documentary. “The companies on Wallstreet were bailed out, and the people on Mainstreet were left out”. The debut of this documentary will take place on November 1, 2014 at 2 pm at the Jepson Center for the Arts located at 207 West York lane, Savannah, Ga.